That's it. Rich Guy is heading back to Asia. It's a sad, sad day... I have lost a willing eating companion! It's not often you have someone who is willing to eat anytime, anywhere (well, almost) and at any cost. Talk about a foodie's dream come true. Fine, so be it. He'll be back. He always comes back. Then the eating begins once again! But to take advantage of his eating prowess one last time, I offered to drive him to the airport. Being a 10:00pm flight, I suggested we go eat first. And yes, he was all up for that. For some reason or another, every time I have dined with him, we've ended up at an Izakaya. There was Guu wi th Garlic, Nan Chuu then finally Guu Garden. So to keep the streak going, I suggested we try Manzo. So after checking in at the airport, we headed off to Alexandra Road to find that Manzo was not open! 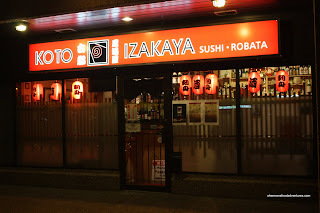 Luckily for us, while we were turning onto Alexandra from Hazelbridge, we noticed another Izakaya on the corner. We ended up going to Koto Izakaya as a result. Honestly, we knew nothing of the place and took a chance. Upon entering the place, it sure looked nice and Japanese. However, I did notice the owners speaking in Cantonese. No matter, again, it's not important who makes the food, as lon g as it tastes good. At the suggestion of the owner lady(? 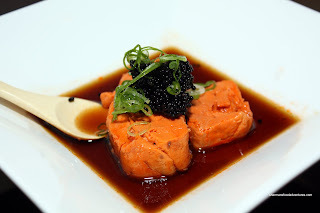 ), we started with the Ankimo (or Monkfish Liver). I've had it once before and in this particular case, the colour was a very dark orange (rather than the pale foie gras colour). I'm not exactly sure why that is, possibly due to the cooking process? It was topped off with cavier and bathed in a dark ponzu. Rich Guy was a bit nervous to try it; but he ended up liking it. Having similar properties as foie gras, there is a certain creaminess and slight hint of the sea that sets it apart. We really enjoyed eating this dish. 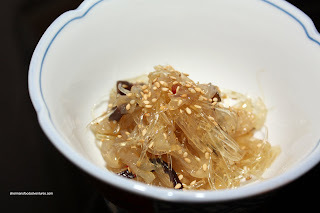 Next up was the Jellyfish Shark's Fin Salad. Both the jellyfish and "shark's fin" had the snap texture that makes it a joy to eat. Lightly seasoned with sesame oil and soy, this was pretty good, if not exhibiting a "Chinese" flavour. Of course Rich Guy chose the Salmon Carpaccio again. This particular version is a bit different since there is no ponzu; rather it's a vinaigrette with mayo, onions and fried taro. The salmon was fresh and the flavours worked (a bit sweet, tart and some saltiness); but we felt that it could've been slice d a tad thinner. 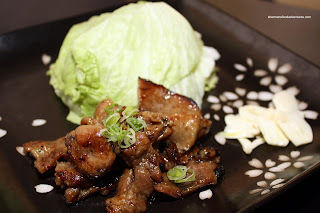 Another recommendation was the Pork Belly with lettuce and raw garlic slices. Tender slices of pork belly were grilled with some nice colour and charring. We couldn't help but noticed that it tasted a whole lot like Korean BBQ being a bit sweet and tad salty. Whatever the case, once wrapped in the crisp lettuce and accompanied by the sharp taste of raw garlic, this was quite tasty. Since Koto is not exactly a true Izakaya (they offer sushi too), we decided to try 2 of their many specialty rolls. The first being one of the most expe nsive - the Black Dragon. Essentially a dynamite/California roll with unagi, avocado, tobiko, mayo, unagi sauce and black sesame seeds on the outside, the roll was pretty good. We would've liked to see more bite in the sushi rice (on the softer side); but all-in-all, a tasty combination of textures and flavours (it was pricey though at $12.95). Another roll that caught our eye was the Volcano Roll. 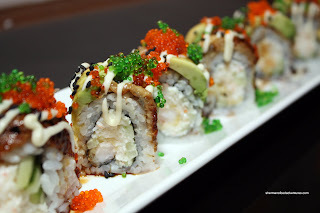 Another California roll topped with real crab mixed with sweet mayo then baked. Although we suspect only the mayo topping was baked, not the roll itself. 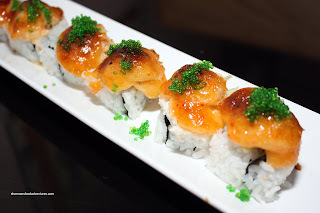 The best way to describe this roll would be a California roll topped with motoyaki sauce full of crab meat. I was a bit nervous at first since motoyaki sauce is quite rich and overwhelming (in terms of fattiness). However, it was actually alright. I think the plethora of crab meat helped cut the greasiness. Not an outstanding roll by any stretch of the imagination; yet it was interesting and didn't offend. Despite the fact that Rich Guy was nervous once again, I went ahead and ordered the Salmon Yuuke anyways. He wasn't that keen on the raw quail's egg on top. I explained once mixed in, he wouldn't even notice it. I have to say that the presentation of this dish is one of the nicest I've ever seen. It made for a great picture! 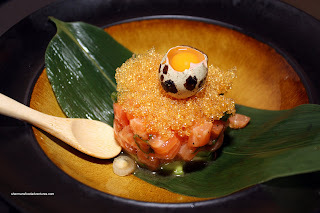 The portion was also very good with lots of fresh salmon, avocado and tobiko on top. Nori was served on the side as eating vessels. In this particular case, I wished it were shrimp chips since they provide a nicer texture contrast to the soft ingredients. When the Beef Carpaccio arrived, we were a bit confused. 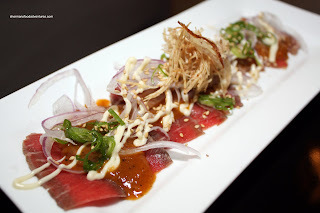 It resembled Beef Tataki with it's slightly cooked sides. Topped with the same ingredients as the Salmon Carpaccio, this was an okay dish. Again, a ponzu type dressing would've probably provided more zing and impact than the vinaigrette. The beef itself was fairly tender, if not a tad stiff. Interesting, despite our initial concerns that Koto was not an authentic Japanese Izakaya, the food turned out to be pretty good. Sure, some of the flavours were not the familiar ones we'd expect from a Guu or Gyoza King; but they mostly worked. If we look at it from a purely dining enjoyment point of view, we liked our meal, especially with the decent portion sizes and reasonable prices. The friendly lady made it even more enjoyable. 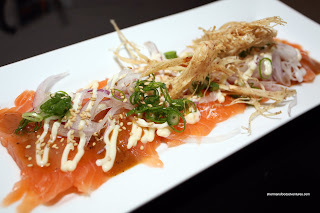 interesting dishes - i need to drop someone off at the airport so i can get some salmon yuuke. i would probably have to do it sans egg though - eggs creep me out. is it really that much better with egg? if i closed my eyes and mixed, would i know? as always, I think you got some great shots, that Quail's egg looks quite artistic! It's funny what you said about the motoyaki, I always want it until I order it and taste it, and it's just too rich, and I regret it...Anyway, nice find!! Good idea next time I'm going to the airport! Kim, you're pictures are still better... LOL... but I do like the Salmon Yuuke pic! Trisha, the egg only adds a buttery texture. You can't really taste it. I suggest you try it!